Star Magic artists led thousands of running enthusiasts in a fun run that aims to help counter the rise of diabetes cases in the country. 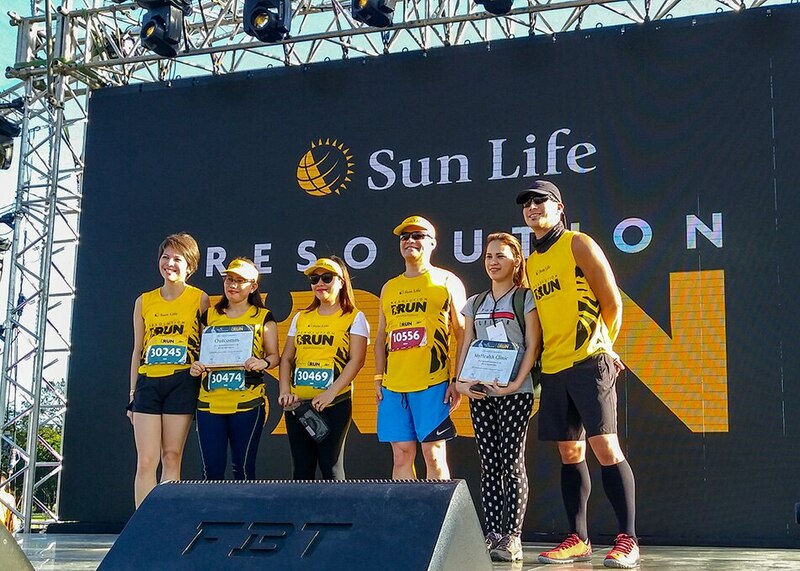 Dubbed the Sun Life Resolution Run, the event is organized by Sun Life Financial and aims to spread awareness on diabetes prevention while also encouraging Filipinos to lead a more active and healthier lifestyle in 2018. In fact, part of the event’s proceeds are donated to the diabetes awareness programs of the Institute of Studies for Diabetes Foundation, Inc.
“We, as a corporation, are trying to invest in our community. And for us as an insurance company, we’re not just about helping you with lifetime financial security, we want you to enjoy a long, healthy, and prosperous life,” said Sun Life President for Asia Claude Accum as he welcomed the runners at Camp Aguinaldo, where the event was held. “In an event like this, we have a great opportunity to raise money for the community. I’m also proud of the fact that we’re not only raising money for three charities here in the Philippines, but across all the countries that we’re doing this,” Accum said, explaining that Resolution Runs are also held in Vietnam, Indonesia, Malaysia, and Hong Kong. The run also champions education, as part of the proceeds are allocated to the scholarship programs of Hebreo 12:1 Foundation and Star Magic. The Noordhoff Craniofacial Foundation likewise benefits from the event. Sun Life President for Asia Claude Accum turning over charity cheque to one of their beneficiaries Institute of Studies for Diabetes Foundation, Inc.
As it is every year, the Sun Life Resolution run enjoyed the support of many celebrities, led by Sun Life brand ambassador Piolo Pascual. The showbiz heartthrob advocates a healthy lifestyle to help prevent diabetes. Piolo’s fellow Star Magic artists also joined the event, participated in the different categories: 500-meter dash for kids; 500-meter walk for adults; and the 3K, 5K, and 10K runs. Among those spotted were Inigo Pascual, Robi Domingo, Enchong Dee, Matteo Guidicelli, Nikki Valdez, Ysabel Ortega, and Marco Gallo. Meanwhile, Kisses Delavin, Edward Barber, Maymay Entrata, and Inigo also performed in the post-run show. Award-winning actor and health buff Piolo Pascual (rightmost) leads the awarding of the Sunpiology sponsors, with Sun Life Financial Philippines Chief Marketing Head Mylene Lopa (leftmost). While runners had fun pacing with the stars, they too were eager to support the run’s advocacies. Another participant, Olive Cristobal, 46, said that she wanted her three kids to be aware of the illness because it runs in their family. “I brought my kids because I want to experience the run [with them]. Mayroon kasi kaming history of diabetes in both sides of the family so we want to know more about it, how to prevent it. Lalo na ngayon yung mga cases, it’s becoming younger and younger,” she said. Based on a data from Harvard Health Publishing, an average person who weighs 155 pounds can burn up to 298 calories if he runs 5 miles per hour. Health experts also said that being physically active can prevent people from developing diseases that can be fatal, and one example is diabetes, which is the fifth leading cause of death in the Philippines. 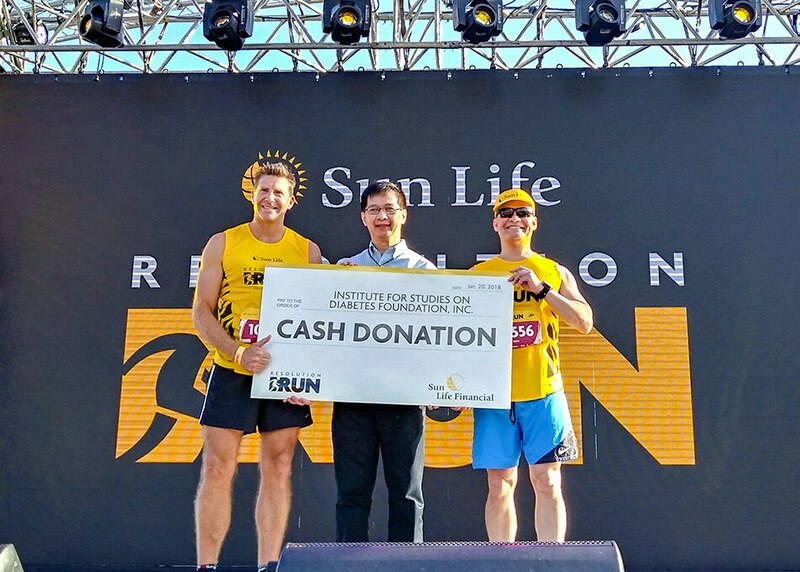 The Sun Life Resolution Run is the second part of the Sunpiology Duo, a bike run event which commenced with the Sun Life Cycle PH last November.